Cook pasta according to package directions. Reserve 1/2 cup of the pasta cooking water. Drain pasta and return to pot. In a small bowl, combine reserved pasta water, olive oil, lemon juice, salt and pepper; mix well. 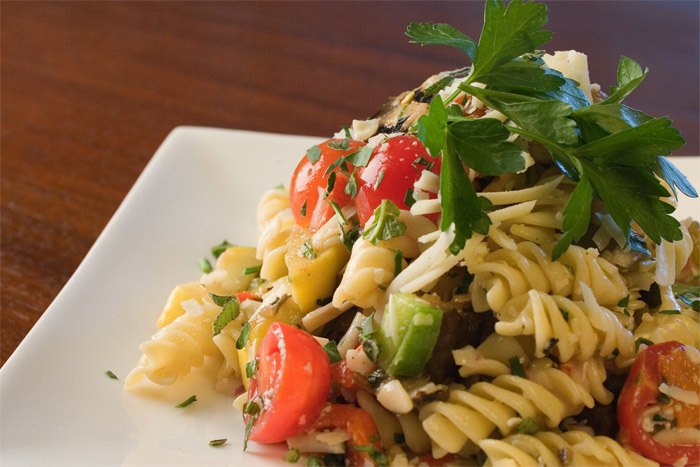 In large bowl, combine both bell peppers, corn, mushrooms, peas, red onion, tuna and cooked pasta. Add oil mixture and toss gently before serving. Heat the oil in a nonstick pan over medium heat. As the oil is heating cut the chicken breast into 3 slices, then code it with bread crumb, cheese, salt and pepper to taste, pressing so the bread crumbs stick. Place chicken in the pan with the garlic and saute for 2 to 3 minutes on both sides. Then in another fry pan saute the spinach with a little bit of olive oil and 1 clove of garlic until they are soft and tender. For serving top with marinara sauce and flash it in the oven for 1 minute or so, take it out of the oven and plate it with more marinara sauce and spinach.